Pat Sloan is On the Air! I love listening to podcasts while I sew. I have a whole range that I enjoy, from cooking shows to game shows. But what could be more fun than listening to a show about quilting, while I’m actually quilting? The team of Pat Sloan, American Patchwork and Quilting, and Moda make hitting that sweet spot possible. 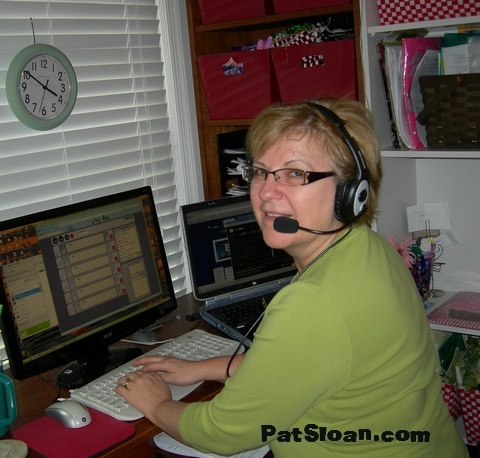 Pat hosts the show from her home in Virginia. 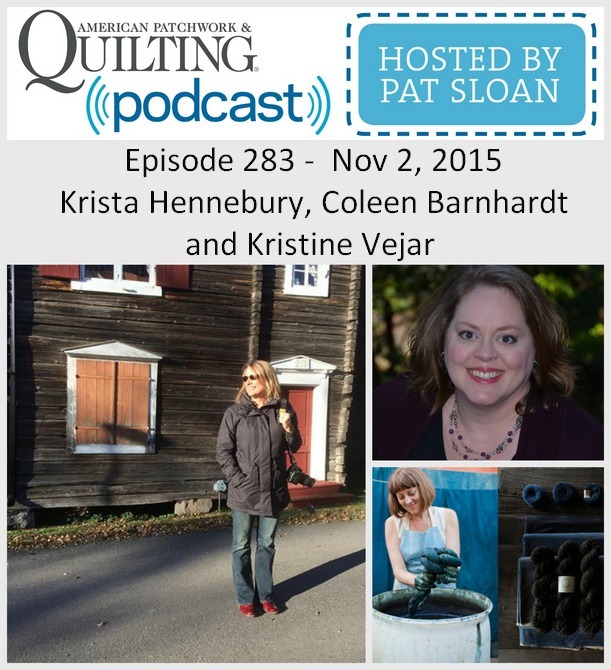 Each week she talks with three or four luminaries in the quilting world. Her guests include well-known designers and Girl Scouts you’ve never heard of (more on this, later). But no matter who she’s talking with, Pat’s goal is the same. “I’m an advocate for the quilting industry and love to share the work of the people in it,” she says. Her friendly, fun-loving style make her the perfect host. 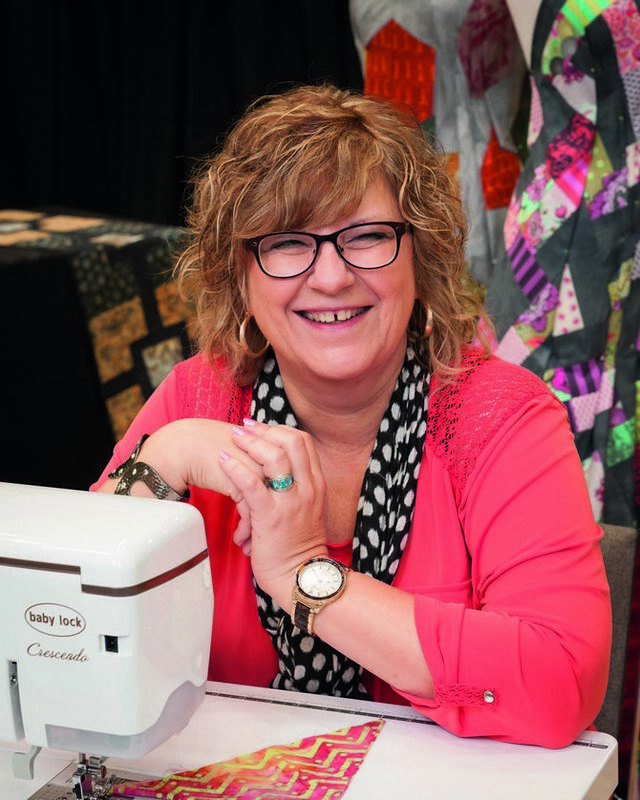 Pat started the show on her own about five years ago, and a year-and-a-half later she partnered with American Patchwork and Quilting: Moda is the show’s sponsor. 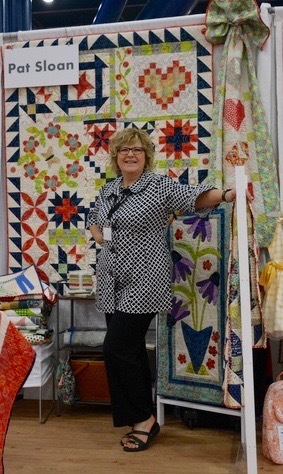 Today, she hosts around 40 shows annually, while the editors of American Patchwork and Quilting host another six shows a year. There are also eight “encore” shows. Pat sits at her desk in her Virginia home when she’s interviewing her guests but the show is recorded and livestreamed at 4 p.m. EST on Mondays by TogiNet Radio of Tyler, Texas. Most people choose to listen via the podcasts, which are archived and can be enjoyed at any convenient time. The show’s audience includes 200,000 subscribers and there have been as many as 250,000 downloads of a single show! Pat’s always on the lookout for guests, and learns about potential interviewees from sources both formal (press releases) and informal (word-of-mouth). The Girl Scout mentioned above was earning a badge by participating in painting “street quilts” in New Jersey—Pat learned about the effort from a newspaper article, and a recent show included an interview with Coleen Barnhardt, whose “coloring quilts” Pat learned about when someone shared a photo of Coleen’s work on Facebook. Occasionally Pat will do a theme-based show, such as machine quilting, and talk with an expert on just that topic. 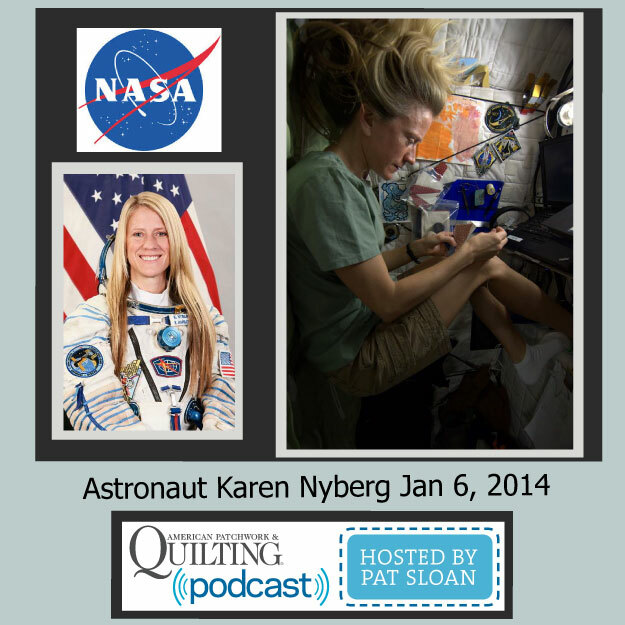 Though Pat enjoys talking with all her guests and bringing their quilting stories, techniques, and information to listeners, there’s one interview she calls “the highlight of my career.” That was the time she took a chance and contacted NASA about interviewing astronaut Karen Nyberg, the first person to quilt in space. Though Pat worried that the recording of the interview might get lost, no problems occurred and Pat says that Karen was “just lovely and very personable.” One of the things Pat asked Karen was whether sewing in space was a scientific study or just a personal choice, and it turned out it was the latter. “I thought it was so interesting that though she could take very few personal items into space, quilting was so important to her that she decided to take it along,” says Pat. You can download (free!) individual podcasts through ITunes, or subscribe (also free) to American Patchwork and Quilting Radio, through Itunes. This link gives you directions. More information can be found here. You can also visit Pat’s website for information on upcoming shows and more information on how to listen to the show on your computer, phone, or tablet. Here’s a list of all Pat’s guests, and episodes from the first year-and-a-half of the show can be found here. 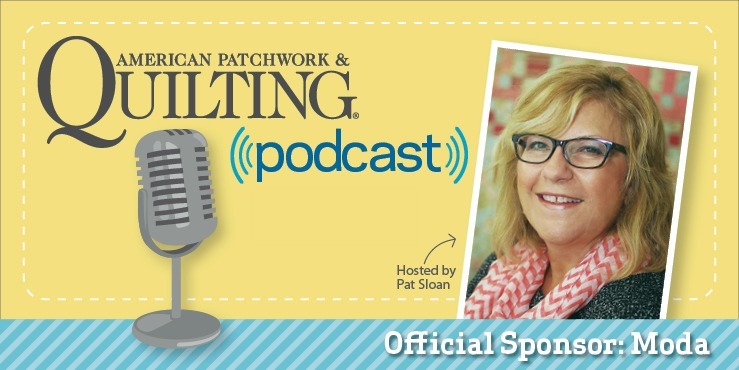 By Linzee McCrayIn TrendingTagged American Patchwork & Quilting, Moda Designers, Pat Sloan, radio6 Comments on Pat Sloan is On the Air! I live in the Kansas City area and travel to see my grandsons in Texas many times per year! Driving to Dallas and then Houston gives me about 15 hours of Pat Sloan APQ Quilt Radio each way! The podcasts are always exciting and motivating as they make the drive so enjoyable!!! Thank you Moda for your sponsorship!!! I love the sampler quilt behind Pat-is it one of her patterns? I adore Pat’s podcasts. I listen to them on my iPad while I sew. Hi Suzette – Yes, it is. It’s one of Pat’s new quilts for her Hometown Girl fabric collection and the sampler is called Hometown Charm. The pattern will be available soon. Usually when my husband and I travel, I end up listening to hours and hours of money or investing podcasts and more hours of sci-fi stories. So one trip I settled down to have a nap when my husband started the Ipod and much to my surprise, there was Pat Sloan’s podcast! In fact he downloaded several hours worth. It was the best road trip ever. I can now do this on my updated Kindle. So I can listen anywhere. Not just on my big girl computer. Not just new ones but the old ones. I mean past ones not old.